Mega-City One - a sprawling megalopolis covering the entire Eastern seaboard of the United States, with a population of over 400 million citizens crammed into many mazelike strata of cramped apartments and dingy corridors. This would be the worst possible environment in which to face a hostile xenomorph with incredible agility, acid for blood and better armour than a Manta prowl tank, not to mention an unsurpassable desire to shred, rip and tear citizens into dog chow. Of course, something like that could never turn up here, in Mega-City One...could it? It is up to Judge Joe Dredd, veteran lawman of Mega-City One, and a team of hardened street-judges to prevent the bio-mechanical monstrosities from turning the city into an incubator for a horde of Aliens unimaginable even in Ripley's worst nightmares. 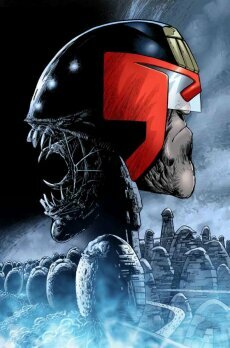 Judge Dredd/Aliens: Incubus has been co-written by legendary Dredd creator and regular Dredd scribe John Wagner, and ex-2000 AD editor and 2000 AD/Vertigo writer Andy Diggle. Art duties have been taken on by 2000 AD mainstay artist Henry Flint, who has proven over the course of stories such as Shakara, ABC Warriors and Nemesis The Warlock that his ability to draw terrifying alien creatures is second to none. Judge Dredd has been the lead character in the award-winning UK weekly sci-fi comic 2000 AD for over 25 years, and the future lawman is part of British culture to the extent that few people growing here over the last three decades are not familiar with the characters and attitudes featured in the strip. Dredd has appeared in many different media, including a successful feature film (with two more on the way) and the stunning new Dredd videogame from 2000 AD owners Rebellion, due for release in 2003. As a result of many massively successful Dark Horse comics and graphic novels, Alien has proven to be one of the most successful crossover characters in the history of comics, aided by intelligent storytelling, great art and the nightmarish nature of the xenomorphs themselves. Jason Kingsley, CEO of Rebellion, says, "I have always found the Aliens to be a fascinating, scary concept, and working on the Bafta-nominated Aliens Vs. Predator PC game was one of the highlights of my career, so it's great to be in a position to organise a confrontation between them and Dredd on the pages of 2000 AD. In many respects it's a dream come true. Or should that be a nightmare!" Andy Diggle, co writer of Dredd/Aliens: Incubus, commented, "This is one of those dream scenarios that tend crops up in drunken late-night conversations - which comic characters would you love to see face off against each other? I'm a huge fan of the Alien movies - especially the first one - and pitting Dredd against the Aliens is making this fanboy very happy indeed. I think it's weak to just use Aliens as cannon-fodder, so we're working hard to make them absolutely lethal, the ultimate killing machines. Trust me, you put just one of them in a room full of armed Judges, and within thirty seconds there aren't going to be many people left standing. Multiply those numbers by several hundred and it's big fun in Mega-City One. It's a huge honour that John Wagner invited me to co-write the series with him, although it's also pretty daunting. I mean, it's JOHN WAGNER, fer chrissakes. But while a humbling experience, it's also a very educational once, as I'm effectively getting personal tuition from one of the best writers in comics - and getting paid to do it! And of course Henry Flint is making it all look fantastic with his incredible talent for dynamic weirdness. Henry doesn't shy away from drawing the difficult stuff - in fact, he encourages it! You want to draw Dredd trying to fight off fifty facehuggers simultaneously? You got it, Henry, you got it..."
2000 AD is on sale every Wednesday, priced £1.40. The Judge Dredd Megazine is on sale the first Wednesday of every month, priced £3.95. Aliens TM & © 1986, 2002 Twentieth Century Fox Film Corporation. All rights reserved. TM indicates a trademark of Twentieth Century Fox Film Corporation.